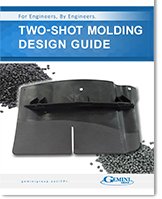 Two-Shot Injection Molding: Secondary Operations | Thumb Plastics, Inc. Whether your injection-molded part is large or small, simple or complex, Thumb Plastics has what it takes to get the job done. 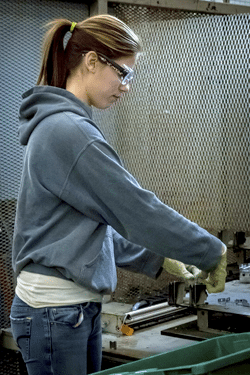 We specialize in a variety of techniques used for plastic welding, riveting and staking, and assembly to complement our injection molding processes. Keeping your component under one roof will help eliminate shipping costs, decrease lead-times, and enhance accountability. If your component is more than a simple shoot and ship, then we should talk. Ultrasonic plastic welding involves converting high frequency energy into a mechanical motion (vibration) to create frictional heat in a focused area. The heat generated melts the plastic forming a molecular bond. This technique can be used for welding plastic to plastic, plastic to vinyl, and plastic to metal. A fairly new technique used for welding plastic is infrared plastic welding. This welding technique is typically used for large part assemblies with high strength and hermetic requirements. The process utilizes a controlled infrared light emitter which welds plastic assemblies by melting the joining surfaces which are then joined together and re-solidified under pressure. Hot plate plastic welding is another process which can be used for large part assemblies. Heat is applied to the joint areas of parts for a predetermined amount of time, the parts are then removed from the heat source, and finally brought together and allowed to solidify under pressure.